Sister Friede is one the two new bosses that you will encounter in the latest DLC “Ashes of Ariandel” for Dark Souls 3. Gravetender is the final boss that you’ll find in the game. 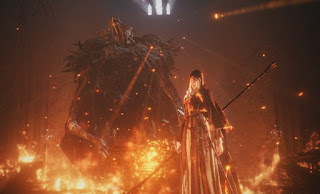 But Sister Friede is clearly the hardest one to deal with, because she does not come alone, but is supported by her Father Ariandel and the Blackflame Friede. Can you defeat them? In preparation for the boss fight against Sister Friede you should summon the NPC Slave Knight Gael. He helps you during the fight against Sister Friede. Then the Slave Knight Gael comes help you in the second phase, because in this phase you’ll face two bosses. Gael can take care of one of these bosses completely, so you don’t get the damage from the two alone. Among the strengths of the Boss Sister Friede certainly the Frost damage. This can cause frostbite on you. That, in turn, the regeneration of your endurance will slow down. Therefore, you should have equipped with an Armor that has a high thermal insulation. In addition, it is useful to Chillbite Ring to apply. Friede is actually given it to you, when you encounter her for the first time. When you enter the battle arena, the Boss fight against Sister Friede begins and you start the first phase. Here you will encounter only the Sister Friede. She has a sense that she knows to use. However, she has only a small entertainment value that you should make you benefit, because that you have the possibility to suspend many of her attacks by fast hits. Sister Friede usually attacks if the change the weapons posture of her Sense. This attack can no longer be blocked and you will be thrown into the air. At this point try to avoid. Occasionally, Sister Friede will become invisible. So if she pulls back, then you know that she will be gone for a short time. During this time, she will take a different position in the arena and then attack you from there, causing a lot of damage. Pay attention in this case to the ambient noise, because you can hear her steps so that you can locate her current position. If you are close enough to sister peace then she becomes visible again and attack you. Here, you can perform dodge roll to avoid this attack. As soon as you defeat Sister Friede in the first phase, the second phase of the battle begins. Now, Sister Friede’s dad Father Ariandel engages in the fighting, as he revived Friede. Now you face two enemies. Immediately, Slave Knight Gael will come to assist you if you have summoned him before. As Sister Friede and Father Ariandel share a life bar, it does not matter who of the two you attack. While Ariandel operates more slowly, but has strong attacks, so Friede is rather quick move with rather less devastating attacks. However, both have extensive surface damage, even with Fire and the other with Frost. It makes sense that Slave Knight Gael attracts the attention of Friede, so that you can turn completely to the other boss. Here use the back bar and you will quickly bring the second phase behind you. This is also important because the NPC Slave Knight Gael can not drag on forever all the damage on course. Don’t take too long with the second phase. In addition, you need your helper Gael for the third and final phase of this boss fight. In the third phase, Sister Friede transformed into Blackflame Friede. This boss has an incredibly powerful magical damage of the "dark" type. So don’t let the blaze of flame out of your sight and don’t take too long, attack again and again, in order to defend you at the same time. Watch out for her storm attack: She grabs you and can kill you with a single blow. Try to push Blackflame Friede in a corner of the battle arena and then attack with blows, so that she will not get much opportunity to attack you back. In addition, you are not alone, because Slave Knight Gael is (hopefully) still at your side and helps you to defeat Blackflame Friede. The third and final phase of this boss fight will eat a lot of time and we hope that your helper can even spend enough life energy to the end. After Defeating Friede you can transpose her soul back at Firelink and get either Great Scythe or the Rose of Ariandel weapon.